Breakfast smoothies can come to the rescue and help us start our day in a healthy way, no matter how busy we are. Skipping breakfast is something all of us do, some of us never seem to find time for breakfast in the mad morning dash of getting ourselves and our families out of the house, off to work, school, college and so on. What happens then is that we get the mid-morning ‘slump’, that time of the day when we snack on something quick, usually sugar and refined carbohydrate –laden giving ourselves an increased risk of gaining weight in the short-term and longer-term problems with our digestive systems and medical problems such as type two diabetes. Nutritionists tell us that breakfast is possibly the most important meal of the day, healthy breakfast smoothies, even if we do not have time to sit down for a leisurely breakfast meal at the kitchen table will boost energy levels and kick start the day, enabling better concentration on our morning’s work and avoiding the mid-morning ‘slump’. There are many breakfast smoothies recipes, here is one of my favourites which I hope you will try and which will form the basic blueprint for many variations and you will find four more delicious recipes for healthy breakfast smoothies in the video at the foot of the page! How to make Raspberry Breakfast Smoothies. This recipe makes two good-sized smoothies, you can scale the quantities up or down to suit your needs. One large handful of frozen raspberries. The ingredients in this smoothie are designed to help you feel full as the oats give you slow release carbohydrates that will help you stay feeling full right through until lunchtime. The banana is a great source of potassium too (a good tip with the banana which will provide you with and even thicker and creamier tasting smoothie, is to prepare it before-hand and freeze it, adding frozen banana to a smoothie is delicious). Add extra fruit or alternative fruits to taste, depending on what you have in stock and the season. Just whizz everything together in your smoothie maker and if you are really in a rush, decant your smoothie into a vacuum (thermos) flask and take it to work with you to enjoy on the way, or when you get there! 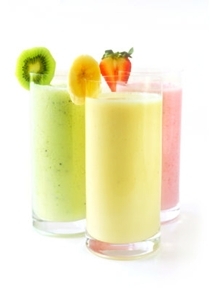 Starting our day with healthy breakfast smoothies which all the family will love, avoids the processed breakfast cereals that might be the only other thing we could make time for. It will also avoid us feeling famished by the time for a mid-morning break comes around when we might otherwise be snacking on a donut or candy bar. Why Smoothies Are Good For You!